Read an interesting article on Business Times today. It headlines “Failure is Not an Option, It’s a Must.” The article was about an interview with author and thinker Nassim Nicholas Taleb, compiled by writer Genevieve Cua. Below is what Mr. Taleb has to say. It is good to have a class of people who are educated. But if you start having a high level of education, you start hiring people based on school success. School success is predictive of future school success. You hire an A student if you want them to take an exam, but you want other things like street smarts. This gets re-pressed if you emphasize too-much education. Singapore has had advantages from the fact that it had no resources…if you look at the history of city states and all the successful merchant cities, you realize the following mechanism. People in Tyre, Lebanon and Sidon initially had no resources. They needed to import copper, for instance from Cyprus. Then they figured out that they can export it. So it’s an over-compensating mechanism for not having resources. Exports are the biggest indicator of a lack of resources, like turning water into gold. There is something called the curse of having resources. Singapore was a maritime state; you didn’t need infrastructure. You had the sea, a harbour, ships. Second, you need scale and the ability to use stressors. Third is that in the 1960s you had difficulties and you had to be motivated. You have to make sure the next generation doesn’t get too comfortable. Don’t over-educate them. Push them harder. Don’t be too nice to the next generation. Progress comes before education. The causality is inverse. If you increase education in a country, you lower the progress. It inhibits risk taking. Wealth leads to the rise of education. Education does not necessarily generate wealth. Education however helps to preserve wealth. You can’t easily transmit wealth to children; there is variation, inflation. But education allows you to stabilize the fortunes. My ancestor made money in trading. He had the presence of mind to have a fund to educate his descendants to force them not to be traders. You stabilize and lower the variance of children with education. Taiwan, which in the 1960s had a much lower literacy rate than the Philippines and half the income per person. Today it has 10 times more income. If you have a master’s degrees, you won’t starve but you won’t be phenomenal. Education is good within the family but on the level of the country, the effect dissipates. You need someone to feed the bureaucrats and magistrates. My father was a doctor, my grandfather a Supreme Court judge. They aren’t producing…You need element of education but like anything, too much is bad. You have to reserve education for those who aim to be scholars. Germany has the right balance. They worship professors but prefer the engineers. What’s more important isn’t education; it’s apprenticeship. Germany has a huge advantage over the rest of the world as it has a high rate of apprenticeship in its economy. Switzerland used to be the least educated in Europe. Now’s it’s the second most educated; that is why it’s going down. To encourage “swashbucklers” and entrepreneurs, people have to be taught to take intelligent risks – something that universities don’t teach. In California, it is said that you need to fail seven times. Mr. Taleb started his career as a derivative trader for 21 years, before holding senior positions in Major financial institutions. He also ran his own derivatives firm for 6 years. Currently, he is distinguished Professor of Risk Engineering at New York University Polytechnic School of Engineering and co-editor in chief of the academic journal Risk and Decision Analysis. 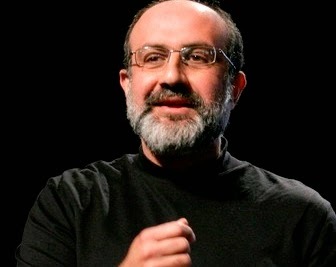 For more information on Nassim Taleb, refer to wiki here. “I am not a professor of economics. I’m a professor of engineering. This is critical. There is no nonsense in engineering. The tolerance for nonsense in economics is monstrously high. In engineering it’s close to zero. If a bridge collapses, economists would spin a story. In engineering, you build another one”. So how many times have you already failed? I had several big falls myself in health, wealth, career and relationships throughout my life. Is failure alone sufficient? Have you learned and improved? Have you tried again more intelligently without losing your enthusiasm? In the stock market, Losing Money is Not an Option, It’s a Must! Those got badly burnt in the past stock market crashes, some never touch the stock market anymore. Losing to inflation slowly is still far better than losing so fast to the Bears and feel so painful. Do we feel so painful over $3 chicken rice? No. Right? S$3 Chicken rice probably overnight to digest. Stock market loss is harder to swallow let alone digest. Thanks for this. It is a very good read. I was just discussing with musicwhiz and Drizzt the other day over why this generation is more likely to include risks analysis than the older generation. The older generation came with mostly nothing to lose so they got only one choice to make and that is go for the win. The older generation.. Hmmm... Not me definitely, hence I don't know. We know who are they in blog space.. Maybe they can comment if they have nothing to loose? I was exposed to "RISK" the board game at a young age. I simply love it then. Just like any other thing, too much risk bad but no risk is probably equally bad. I used have an entrepreneur boss. He took risk and grow the company for >30 years. Took big projects he never done before! Always had cash flow problems due to nature of business & cycles. Company almost bankrupt several times but Never, because of his zest and ability to pick up. More important he understood the business more than any outsider. Many people only see failure when they look at the company books! To him, he is passionate for success and to grow his business. He is a big boss but definitely not rich, has everything to loose, as the only earner in his family of 5. His house is mortgaged, with 500 employees jobs at stake if he failed. He is passionate about his business / employees as part of his life. He is a risk taker! It's his personality and passion, not anything else. It takes just one time in his >30 years to be paid off! And the return was exceptional. He deserved it! Is 66+ belong to the older generation you are referring to? For me I was so Kiasi that I read and read and watch and watch about finance and stock markets for so many years before i dared to plunge into the market at the age of 40. And by then it was not true my generation (at least for me) had nothing to lose. We (my wife's) had our maisonette + cash & CPF money + car to lose. So it was not true we were not risks averse, because we had nothing to lose. And we were just ordinary average wage earners. In fact my wife was so risk averse that we did not invest in property then. Kiasi is better than kiasu! Anyway you are probably prudent, because every cents/dollars are hard-earned! Today's generation spend much more easily without so much thinking. Btw, I am gg to be long winded..LOL.. Bear w me. Tks. I understand what B is implying, maybe wording is misunderstood. I interpret as 60-70s, Sg is poorer and less educated. Only relatively rich, can have gd education and get a good job. Within those not so educated, but more driven ones, they will go all out to start their own business. Make or break! even break is not so serious since you start with nothing initially then. Probably that is "nothing to loose!" Today it's different. We are prosperous and most are educated. Jobs now are more readily available compared to then! It is probably "less incentive" for us to take risk and start a business, and yet we still can have a good life! A wise v successful guy (now 60s) told me before this. In the past 60-80s, you need not to be very "smart" to earn lots of money, because competition is lesser and in general people are more simple. As long as you are little "smarter" or motivated, you can be successful materially. Now it is so competitive! But then again, in the past, it is not so easy to find people that have that slight edge over the rest. Is Messi better than Maradona? Or Maradona better than Pele? Overall no matter which generation we are in, we do have "something to loose!" Environments are different and it's probably unsound to judge and compare! The older generation should accept the younger generation difference! The younger generation should respect the older generation. Ah! You were "lucky" to have worked for that entrepreneur boss. One of the the key values and culture of that company is to encourage all co-workers to challenge the status quo and it's OK to make mistakes. No mistakes meant we have not tried something new... And that looks bad in our annual review. That's where my "poking" and "verification" got their incubation ;). But then, it's nothing new to our Hokkien street wisdom: 有影无? My entrepreneur boss is always someone I deeply respected. Not because of his entrepreneurism, but because he uses his heart more than his brain. It touches me at least! Learning by failing is great way of managing our mind and soul. Great company you worked for. Hmmm... a theme not very familiar to our education system...We must recognize that failure to learn is more terrifying than failing! Hokkien street is good learning. "Got shadow!" But must be very careful, because most I know ended in jail, db, drugs offenses or no bright future.. Only the minority survive, learn and shine. Rolf : very nice article. I believed we learned more from failures than success.. Hence, if is important to fail too! Don't forget we also learn how to build on our successes. 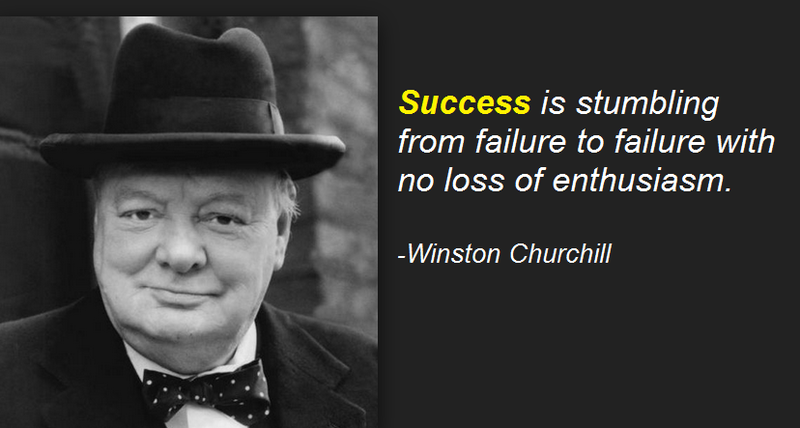 Why, "Nothing succeeds like success"
So have you succeeded making your 1st $100k, $500k, or even the 1st $million. And why they say the 1st $million is the most difficult and after that it is easier? Do you even believe in the 1st place? Thanks for the comments. I think Dr Nassim recognize that success itself is very important. Just that he felt that failure should not be seen as doomsday! I agree with most of your points, and reiterate in my opinion that failure to learn is more dreadful than failure itself. I learned to avoid making past mistakes and recognize how future success may look like. That is a learning! Having said that we can also learn from others experience, but just that it always carve a deeper impression when you experience it yourself. I like the phrase "continuous improvement!"